Issue 8.3 is now online! The March issue of Methods is now online! This issue contains two Applications articles and one Open Access article. These three papers are freely available to everyone, no subscription required. – Solo: Solo audio recorders are inexpensive, easy to construct and record audible sound continuously for around 40 days. The paper also has a video tutorial explaining how to assemble the required hardware and comes with a companion website with more information. – The third dimension: A novel design to obtain three-dimensional data on the movements of aquatic organisms at depths of up to 140m. The set-up consists of two synchronised high-speed cameras fixed to two articulated arms and can be used for any underwater applications that require synchronized video recordings of medium- to large-sized animals. This month’s only Open Access article is ‘Faster estimation of Bayesian models in ecology using Hamiltonian Monte Carlo‘ by Cole Monnahan et al. In the article the authors provide an intuitive illustration of the principles of HMC on a set of simple models. They then compared the relative efficiency of BUGS and Stan using population ecology models that vary in size and complexity. For hierarchical models, Cole et al. also investigated the effect of an alternative parameterisation of random effects, known as non-centring. The results show that Stan is a valuable tool for many ecologists utilising Bayesian inference, particularly for problems where BUGS is prohibitively slow. Our March issue also features freely available articles on Monitoring, Modelling, Measuring Individuals, Dispersion and more. 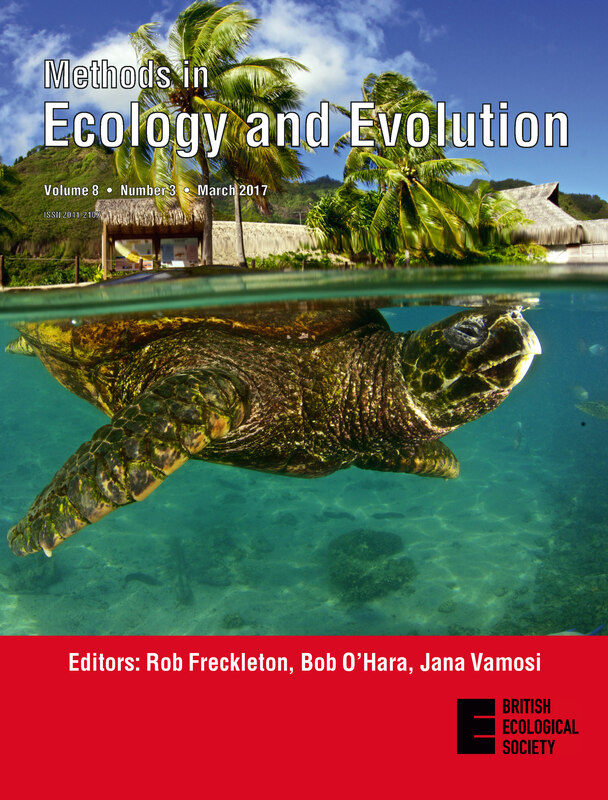 This issue’s cover image shows an endangered green turtle (Chelonia mydas) recovering at the Turtle Clinic in Moorea Island, French Polynesia, after being injured by a spear gun. Turtles continue to be exposed to intense fishing effort in French Polynesia despite their protected status. This highlights the importance of regular monitoring, and proper assessment of conservation interventions in general, to derive reliable conclusions and information to managers and decision-makers. However, it is often challenging to reliably estimate the true effect of an intervention, owing to the diverse sources of spatial and temporal variability in the studied ecosystem. Thiault et al. developed a new statistical approach – called Progressive-Change BACIPS (Before-After Control-Impact Paired-Series) – that extends and generalizes the scope of BACIPS analyses to time-dependent effects. After quantifying the statistical power and accuracy of the method with simulated datasets, they used marine and terrestrial case studies to illustrate and validate their approach. They found that the Progressive-Change BACIPS leads to better estimates of the effects of environmental impacts and the time-scales over which they operate. This entry was posted in Journal updates and tagged Aquatic Organisms, Bayesian, Bayesian Inference, Before-After Control-Impact Paired-Series, Bioacoustics, BUGS, conservation, Dispersion, ecology, evolution, Green Turtle, Hamiltonian Monte Carlo, Measuring Individuals, modelling, monitoring, open access, Progressive Change BACIPS, Stan, Underwater Video by Chris Grieves. Bookmark the permalink.